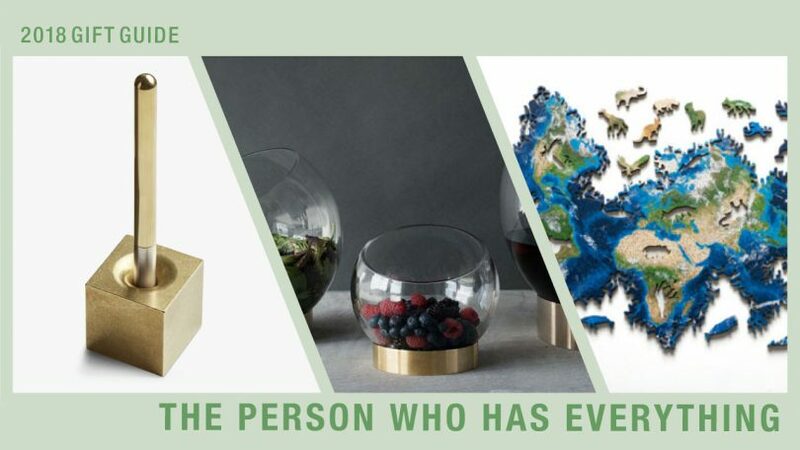 We all have one (or more) of those friends… you know the one… the one who literally owns everything making them almost impossible to buy gifts for. That said, it’s not impossible, just a little more challenging. In hopes of helping you out, we searched for 10 gift ideas for the person who has everything. Definitely a splurge but well worth the money for any design lover or fan of the Eames’. Available in three sizes, these minimalist bowls are a modern and elegant twist on the traditional serving bowl with hand blown glass orbs that rotate into various angles for serving. The stands are sold separately and come in brass or stainless steel. This 1978 clock looks just as modern today as it did when it originally came out. It comes in three colorways, each simple and sleek, but we’re crushing on this unexpected blue color. A vase is always a useful gift for those times when someone gets flowers. This concrete vessel features a black and white design that’s a fun alternative to the typical glass vase.